There is huge confusion in jewellery history around suffragette jewellery. Some jewellery of the late 19th century was green, white and violet. However, violet ranges in shades from purple to pink. 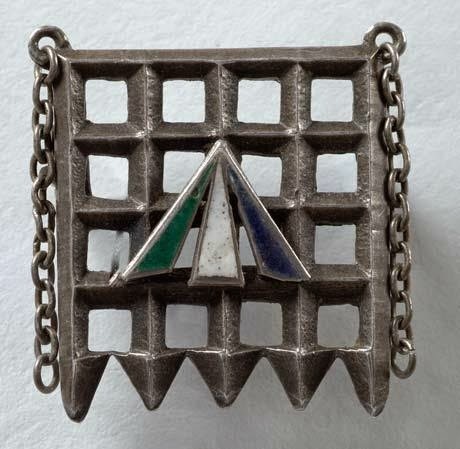 Suffragette jewellery was green white and purple. Funny enough, the Women's Institute colours are green and purple and the WI is currently celebrating its 100th anniversary, having started in 1915. I wonder if there is any significance to their choice of colours? Anyhow, the suffragettes were very active around the first part of the 20th Century. Bill and I recently watched the third part of a BBC programme about them, with one of our favourites Amanda Vickery. The fact that their increasingly violent protests landed them in jail brought about a particular form of jewellery, remenescent of a prison window. These were very popular between about 1906 and the beginning of the Great War in 1914. These pieces are true suffragette jewellery. However, there were more subtle ways for a woman to be supportive of the cause, Mappin and Webb, one of several jewellers holding a Royal Warrant, tended to make nice little pieces of jewellery with diamonds, emeralds and amethysts. A lady could pop in a select something and then casually mention to her husband at dinner "Oh, by the way dear, when I was out shopping today I found the most amusing little trinket at Mappin and Webb and had it put aside. Would you be a darling and pick it up for me?" You see why I didn't try to take many photos during this talk! 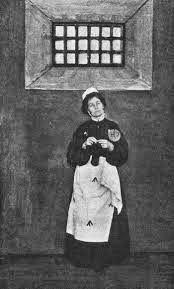 It's so easy to take the rights we women have for granted and to think the suffragettes were a bit mental. However, but for their efforts we might not have the right to vote, the right to own property, the right to have a job - even if we are married. That s a very interesting post, I think a lot of us women completely take for granted the rights hard fought for by our predecessors. Bill's Best Birthday Present: Sausage Making!